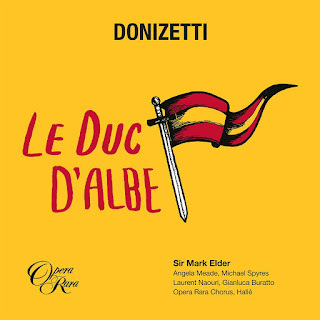 Opera Rara continues its exploration of Donizetti's late French operas with a recording of Le Duc d'Albe. 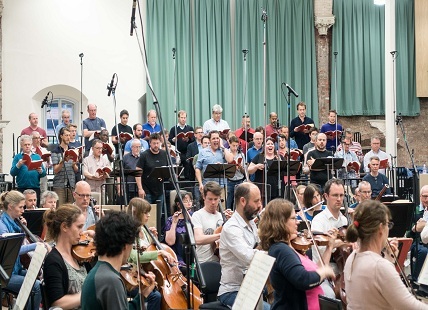 A studio recording made in Manchester with Sir Mark Elder conducting the Halle, the recording features Michael Spyres as Henri de Bruges, Angela Meade as Helene d'Egmont, Laurent Naouri as le Duc d'Albe, Gianluca Buratto as Daniel Brauer with David Stout, Trystan Llyr Griffiths, Robin Tritschler and Dawid Kimberg and the Opera Rara chorus. In fact only half the opera has been recorded. Donizetti started it in 1839 but delays at the Paris Opera meant that other works interceded with Donizetti converting his abandoned L'ange de Nisida into La Favorite for the Paris Opera. Donizetti always intended to complete Le Duc d'Albe but his final illness intervened. When he died he left the first two acts substantially complete but only around 30% of the material for the final two acts. It was only in the 1880s that a composer called Matteo Salvi dared to complete the opera, in a very different style and it is in this form, translated into Italian that the opera is known, if at all. Opera Rara has chosen to record only the first two acts, thus giving us all of Donizetti's performable music with a minimum of intervention by Martin Fitzpatrick. The plot will be familiar because the librettist Eugene Scribe (who co-wrote the original libretto with Chrles Duveryrier) would re-cycle the text, moved from Brussels to Palermo to become Verdi's Les Vepres Sicilienne. It is a typical French grand opera, with a doomed love affair set against a grand historical sweep with great scope for large scale set pieces. Set in Brussels in the 16th century the action takes place the day after the Count of Egmont has been beheaded on the orders of the Duke of Alba who rules the Low Countries for Spain. Act One takes place in the Grand Place in Brussels where Egmont's daughter Helene (Angela Meade) is brought to see the place of her father's execution by Daniel Brauer (Gianluca Buratto). Brauer is a brewer who runs brewery much used by the rebels and he has taken Helen under his wing. There is something of a stand off between locals and Spanish soldiers and, goaded by the soldiers, Helene sings a song of defiance. The appearance of the Duke of Alba (Laurent Naouri) dampens things somewhat, but they liven up again when Henri (Michael Spyres) appears. He is a patriot, firebrand and in love with Helene. The act ends not with a grand finale but with a tense duet between Henri and the Duke as the Duke question Henri closely about his parentage. Act two takes place in the brewery with celebrating workers. Helene appears and believes that Henri has been arrested and so sings a prayer to her father. Henri appears and they swear their love for each other, then get involved with a group of conspirators. But all is quashed when a group of Spanish soldiers appear and the conspirators are arrested. Yet again Henri is not arrested on the orders, it appears, of the Duke himself. The rest of the opera was to unfold with Henri revealed as the Duke's son, and Henri can only get clemency for Daniel, Helene and the conspirators if he publicly acknowledges the Duke as his father. Helene is horrified to find that Henri is the Duke's son and the opera was to end with Helene's attempted assassination of the Duke with Henri dying in the Duke's stead. Donizetti's style is quite sober and dark and though the work is structured traditionally with arias, duets, ensembles and set pieces, the overall 'tinto' is quite consistent and creates a very strong impression with the formal items seeming to grow out of the overall texture. It is a work which seems to herald Verdi's Don Carlos (written in the 1860s for the Paris Opera) and the subsequent Italian operas he wrote which imbue some of the elements of French grand opera. Donizetti's music does not immediately leap of the page, it is a complex work which requires careful listening and despite being something of a torso the power of the two acts makes them quite satisfying in their own right. The effect of just having two acts is to really throw Helene in relief, she has her bravura aria of defiance in Act One, and her intense prayer to her father in Act Two as well as the duet with Henri where they declare their love. (In the full opera this would have been offset by Henri's tense scene with his father in Act Three). The role is a big one, requiring a spinto-like strength as well as the ability to spin a line and sing fioriture. Angela Meade who sings both bel canto and Verdi, including Leonore in Il trovatore certainly has the resources. The recording catches her warm vibrato quite strongly, this does not affect the core of her voice but colours the sound quality of all that she sings. She can float notes beautifully, yet sing with strength. It is quite a large voice, but one which moves with ease. Henri's passionately impulsive nature is reflected in the way that in both acts the character appears suddenly and completely transforms the atmosphere. Michael Spyre's gives a rock solid performance, brilliantly bravura with a finely secure technique and an admirable evenness throughout the range (which is considerable). These type of roles require a combination of flexibility and strength, and Spyres provides both singing with an attractive narrow focus which suits the music perfectly. You could perhaps imagine the role more impulsively sung, but certainly not better. And as we hear Henri mainly in duets and ensembles with others, it is the musicianly way that Spyres performs with the others which impresses. His duet with Helene in Act Two is powerful and intense rather than love-drunk, and the duet with his father in Act One is wonderfully tense. Laurent Naouri does not really get the chance to give us the full range of role of the Duke of Alba, but his appearance in Act One is wonderfully dark and implacable. Threatening without resorting to caricature, and with the intriguing sense of something else (which would be revealed later as his being Henri's father). The other major role is Daniel the brewer, and here Gianlucca Buratto provides strong, sober support and giving his dark voice a lighter tint to contrast with Naouri's Duke. The smaller roles are all strongly cast, with David Stout as a rather nasty Spanish captain, Sandoval, Robin Tritschler as a delightfully drunk soldier, Balbuena, Trystan Llyr Griffiths as another soldier, Carlos, and Dawid Kimberg as a tavern servant. Mark Elder elicits a strong and powerful performance from the Opera Rara chorus and the Halle. Elder has now conducted a number of Donizetti's late French operas for Opera Rara and brings out the sober beauty of the style. Donizetti's writing is not immediately melodically appealing but instead there is a long breathed power to the writing. And the way the music builds out of the structure is stirring. This is a recording which repays repeated listening. It is not an opera that would be easily staged, something would have to be done regarding the subsequent acts, but on disc it makes perfect listening.